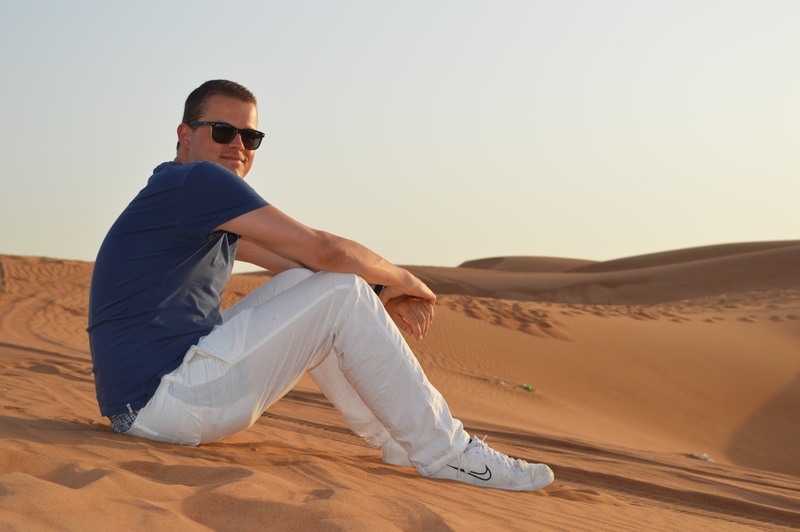 Dubai – to describe this city without using superlatives is almost impossible. So there is the Burj Khalifa, the tallest building and the Burj Al Arab, the tallest hotel in the world. 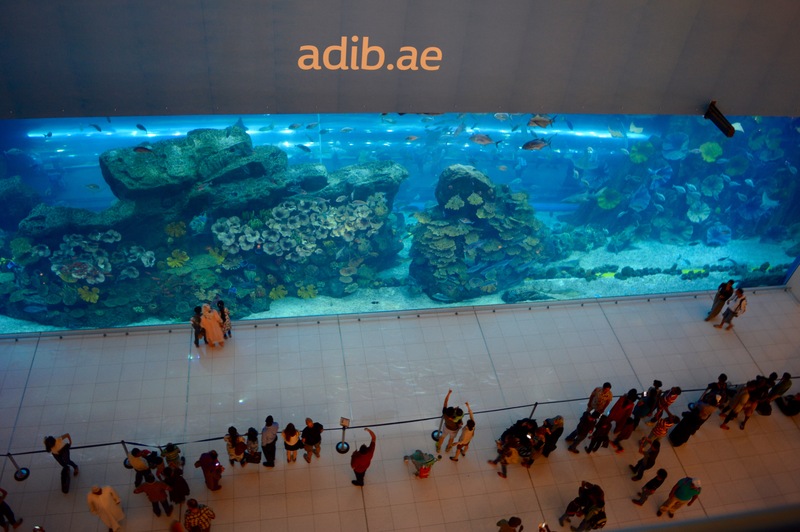 The largest shopping mall and the highest water fountains in the world – in Dubai, of course! Obviously, the city with good weather guarantee is not the home of humility and restraint. But not just because of these world records it is worth to visit the metropolis on the Persian Gulf. The adventure Dubai already begins when you leave the air-conditioned airport and you get touched by the ever-present heat, even in the morning hours. Apart from the high temperatures (at least in May), Dubai is one of the cities that you have to have visited at least once in life. Why? 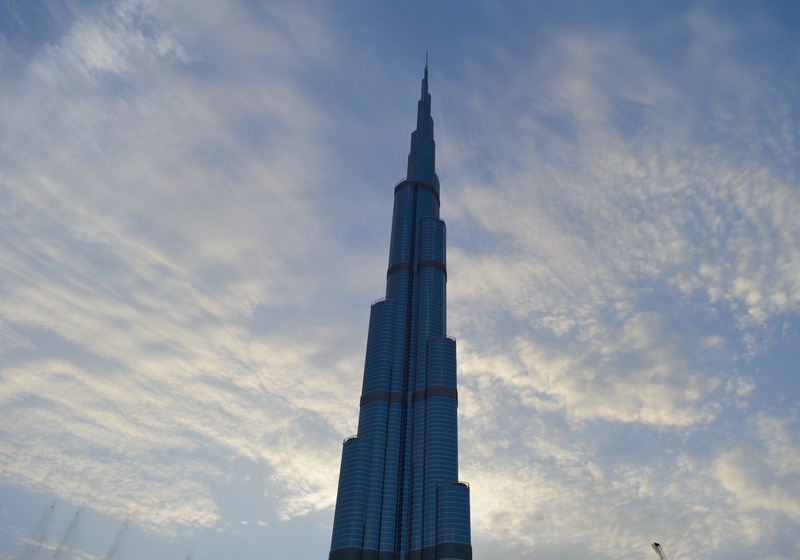 Visit the Burj Khalifa, currently the tallest building in the world – the size of Dubai is visible only from above! 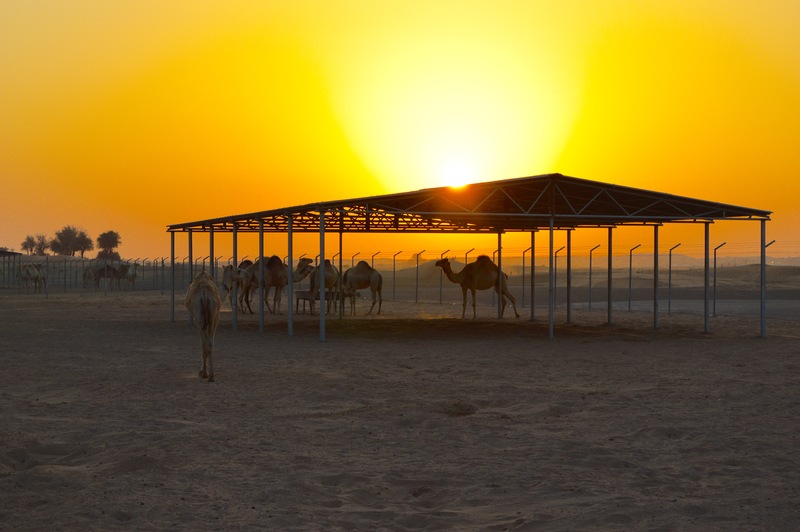 Experience a sunset in the desert – unforgettable! 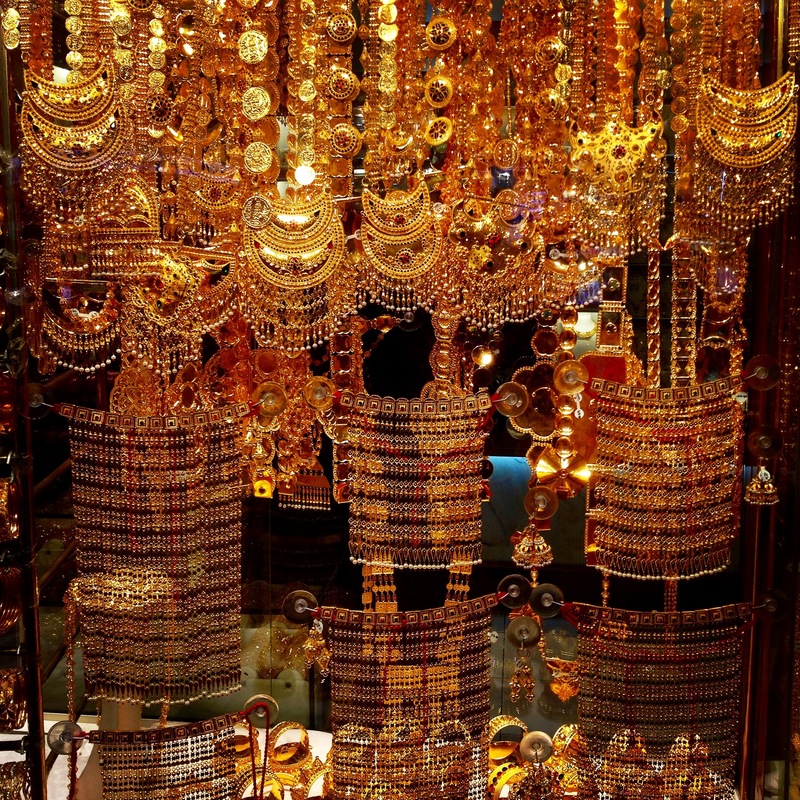 Stroll through the old town in Deira with its famous gold market – unique! Walk along the Souk Madinat Jumeirah in the evening, with an incredible view to the illuminated Burj Al Arab – simply wonderful! Make a day-trip to Abu Dhabi – an absolute MUST! 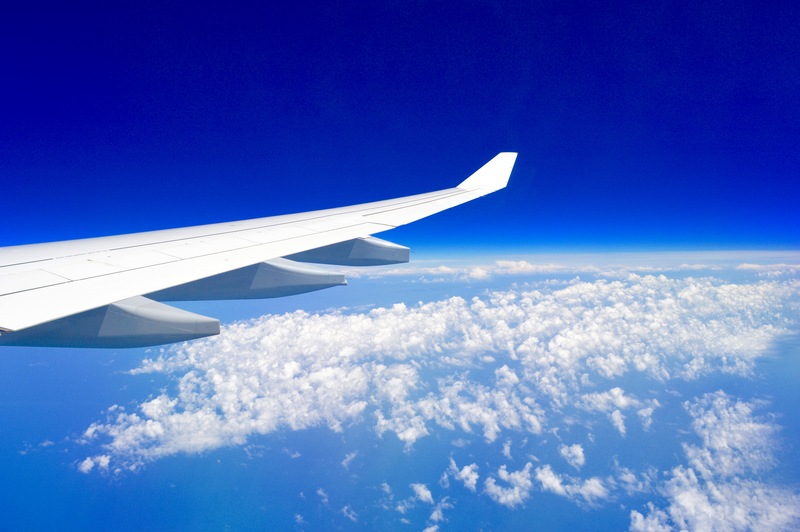 For the journey from Munich, Lufthansa used its long-distance Airbus A340-600. 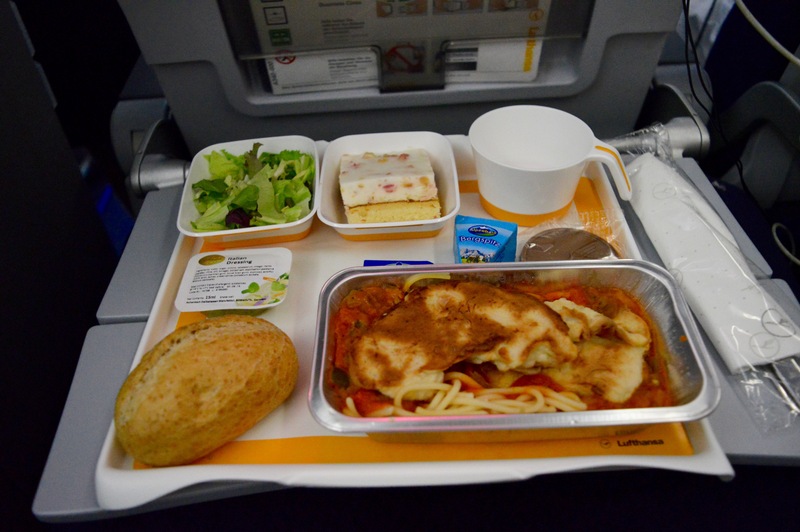 The flight back to Munich was operated by the A330-300. 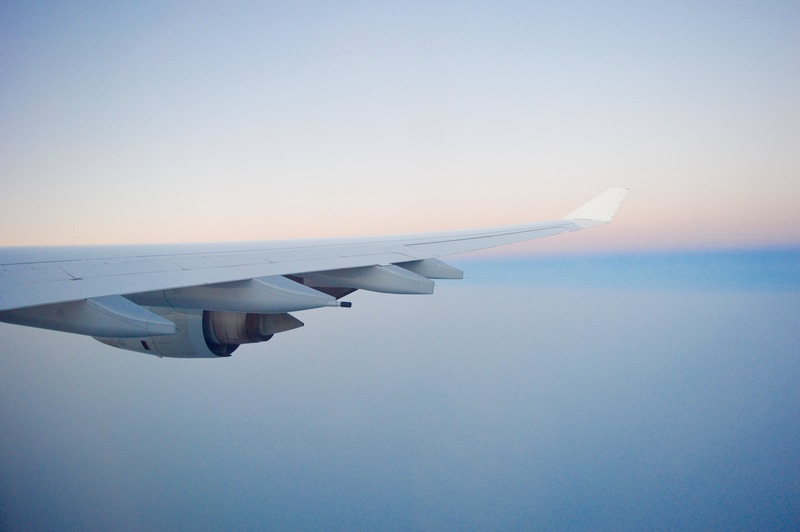 As usual, during both 6-hours flights there weren’t any turbulences and the service was outstanding. Drinks and hot towels were offered several times at night, the entertainment system was up to date and varied – so the time passed in a flash. Upon arrival, the hotel’s own chauffeur service took my directly to the booked Hotel Grandeur. 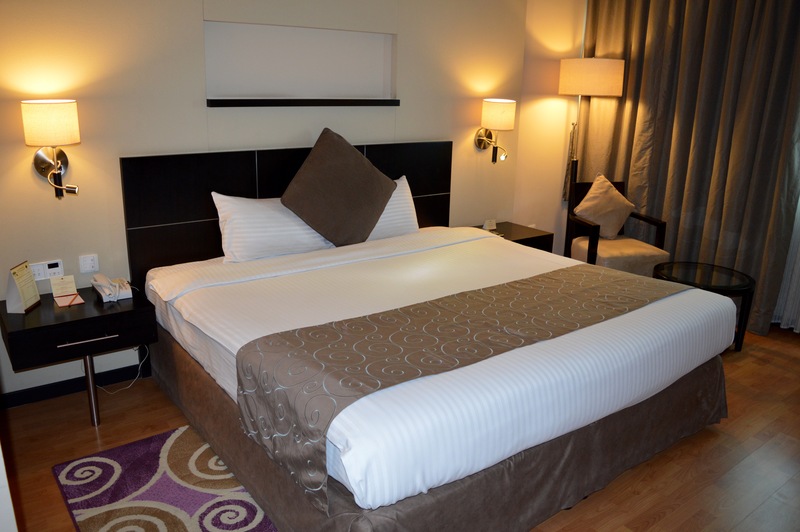 This hotel particularly impressed by the spectacular location, only 10 minutes‘ walk from the Mall of the Emirates. In addition, the hotel has a clean and cooled rooftop pool. Despite the good location, it is recommended to book the varied and tasty breakfast. From sweet pancakes and porridge, there were fresh fruits, various vegetables and even tasty chicken in barbecue sauce – and everything was delicious! Moreover, taking a taxi in Dubai is very cheap! If you have entered the mall, you suddenly notice a unique and very good fragrance that should emphasize the uniqueness of the entire mall. 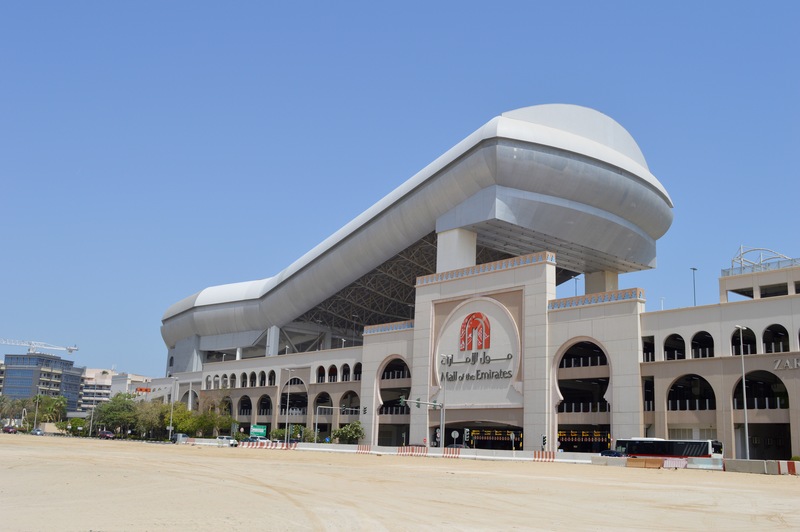 This Mall has become famous mainly because of the biggest indoor ski slope in the world – Ski Dubai. This crazy project almost falls into oblivion, while walking around the 400 shops and over 60 restaurants inside the Mall. Even the supermarket on the ground floor has dimensions of major shopping centers in Germany..! 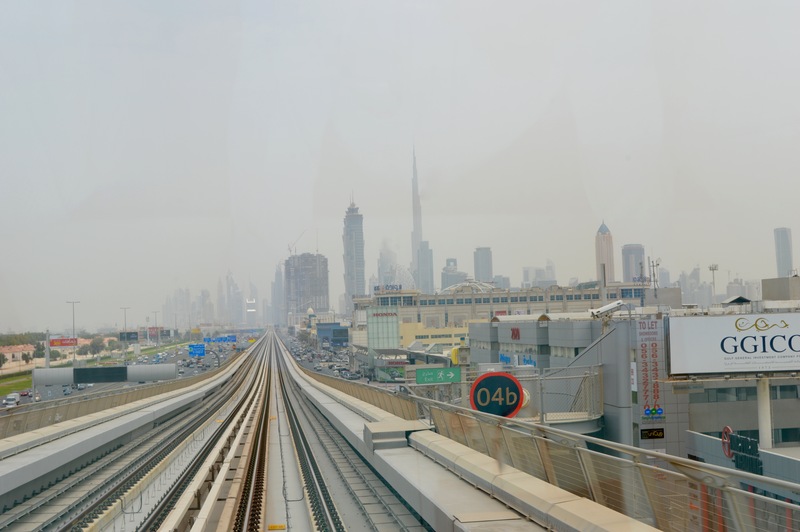 The journey continued with the driverless metro, which crosses parallel to the city highway Sheikh Zayed Road through the city. There are two rates for the Metro to choose. I definitely recommend the gold ticket, which allows to enter the front part of the train. Because the metro has no driver, you have such a nice view of the city and the price difference is negligible. The goal of the journey is already visible in the background. The Burj Khalifa – with 828 meters the highest tower in the world and the most famous sight of the city. 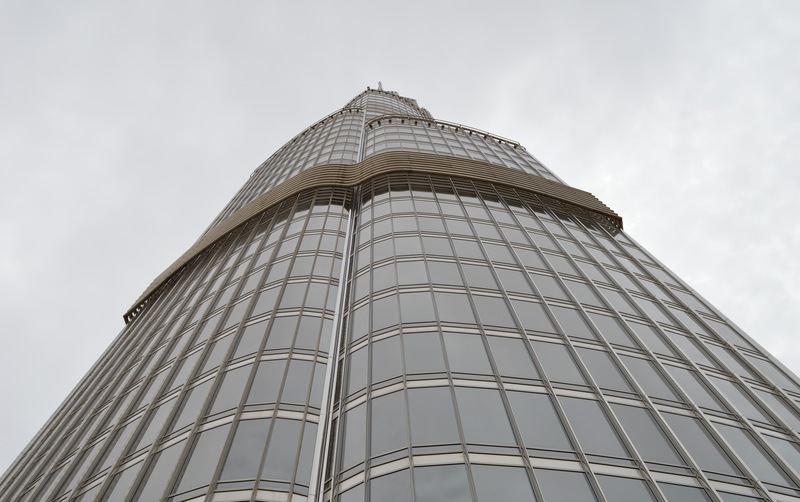 The superlative of superlatives – building with the most floors, the highest restaurant and the fastest elevator (60 km/h) are only some records of the „Khalifa´s Tower“. This elevator itself is an experience – the ride up to the viewing platform at 452 meters above sea level. Exactly 60 seconds are needed to go up to the 142th floor. During the ride the elevators lights are switched off and only small LEDs and futuristic music gives you the feeling of a journey from yesterday to tomorrow. However, it should be mentioned that you need about half an hour walk for the way from the metro station up to the stairs of the tower! „Welcome at the top of the world „. Once more, I want to mention that the visitor platform is „only“ at 452 meters. The tower itself is again 370 meters higher. On the outdoor terrace it is not just very windy – it is also incredibly interesting to watch visitors from different countries, how they want to capture the moment to stand on the highest building in the world. Indians, Americans, Europeans, Chinese – a colorful mix of cultures, all united by the fact of being deeply amazed. And really, the view and the atmosphere up there is truly breathtaking! 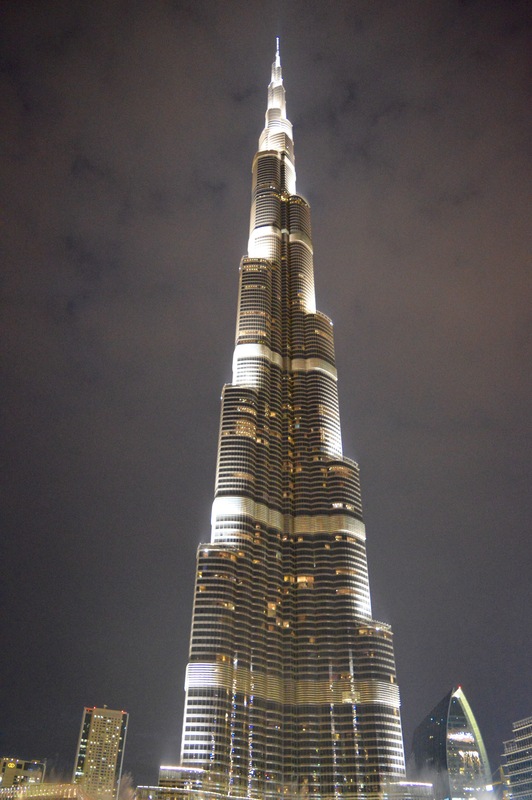 From any perspective and at any time of day or night the Burj Khalifa is impressive! Especially at night, when every half an hour the largest fountain in the world fascinates the visitors. The dimensions of this mall are so unreal that you can´t run through in one day – inside there is an ice skating rink with Olympic dimensions, a 24 meter high waterfall, a cinema with 20 halls and with a length of more than 50 meters one of the largest aquariums in the world. 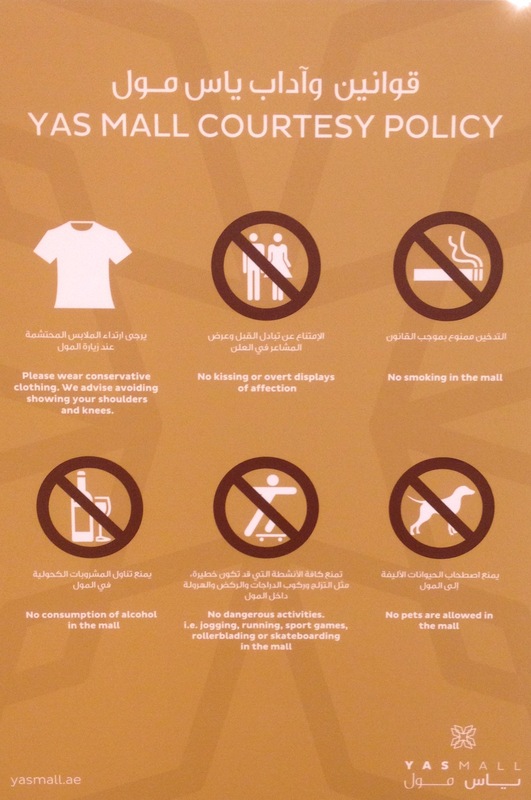 In many shopping centers (here using the example of Yas Mall in Abu Dhabi), a dress code and certain rules of behavior are observed. For example, in addition to wearing conservative clothes it is also forbidden to go as a couple hand-in-hand. 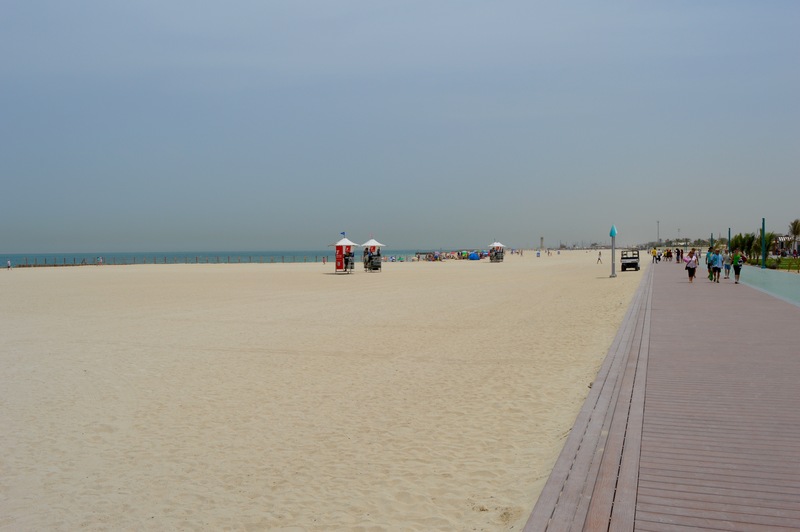 If somebody speaks about the beach in Dubai, it is meant the famous Jumeirah Beach. The section in Jumeirah 3 is particularly beautiful and exceptionally clean. A wide stretch of beach with local restaurants invites you to linger. However, this is just possible with umbrella and sun beds, for which there are waiting lists. 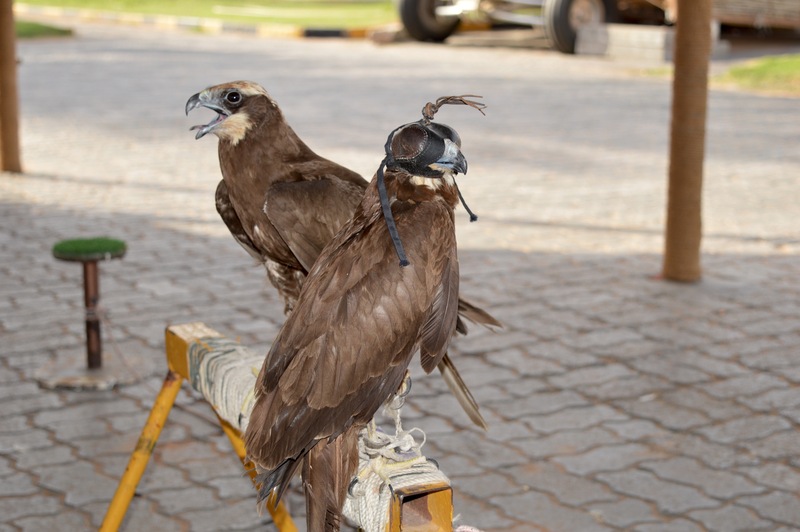 For 60 dirhams (about 15 euros) you can hire such a combination for the entire day. 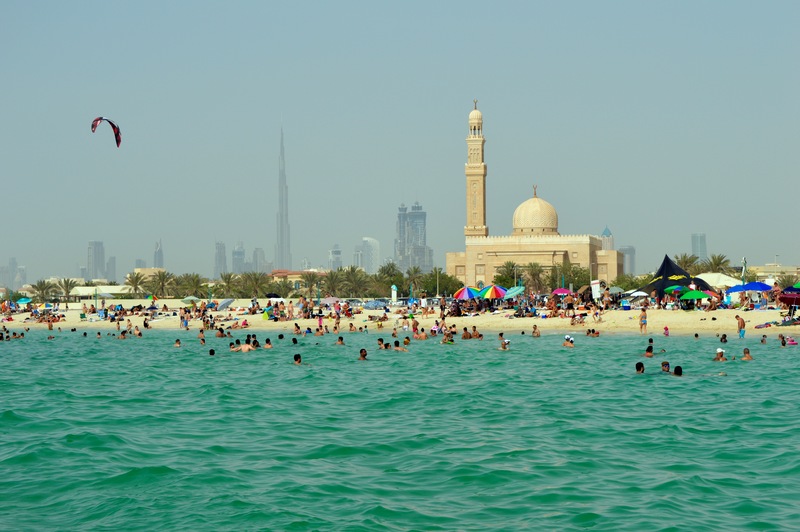 However, the water is not very cooling, because in May the Persian Gulf already has a temperature of about 30 degrees. 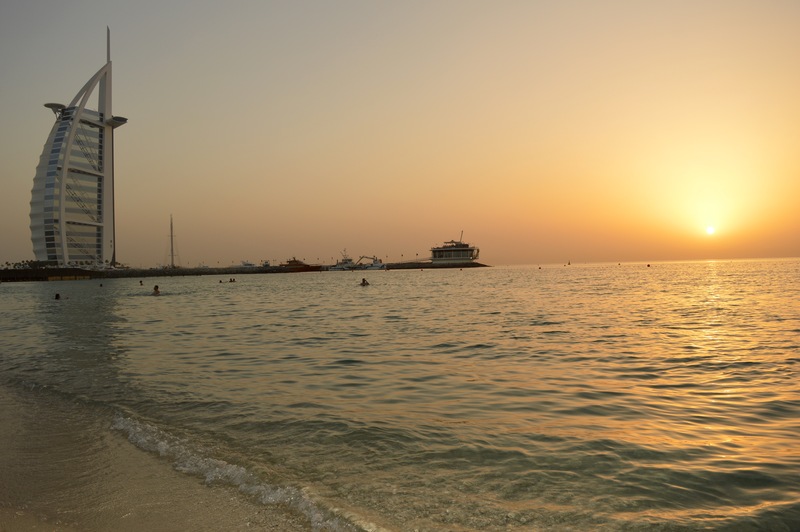 Netherless, it is a gorgeous feeling to float in the calm, warm sea and enjoy the view from the Burj Khalifa on one, until Burj Al Arab on the other side. 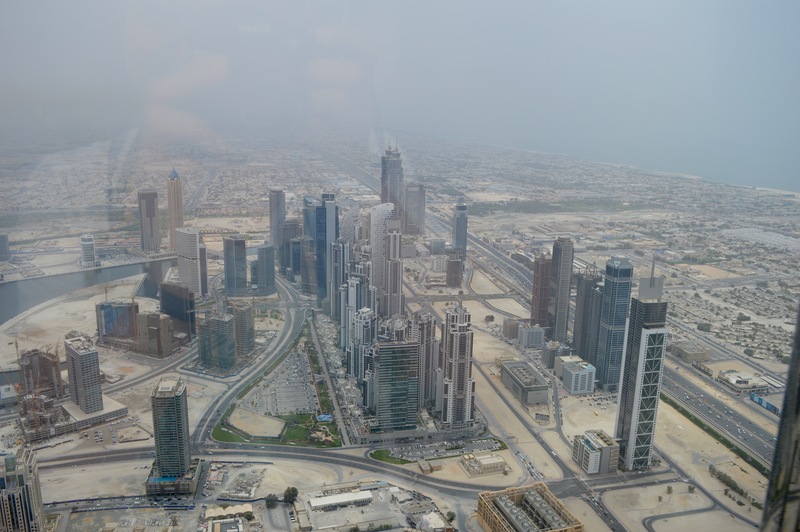 These are precisely the most famous landmarks of Dubai and now you are exactly here. Here in the country of tomorrow, you lie on the sunbed and try to avoid any contact with the hot sand. Nevertheless, you will be reminded to be in a Muslim country – The solid rhythm of the Muezzin prayers are hearable from the nearby mosque all over the entire beach. 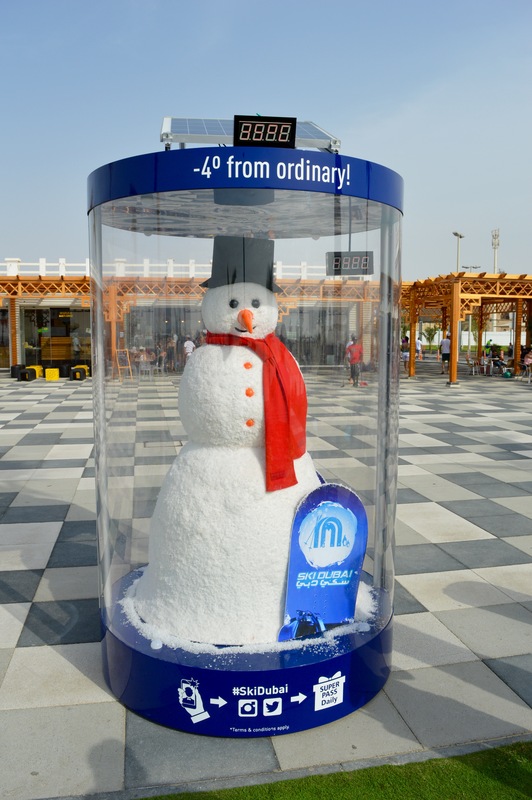 Crazy promotion à la Dubai – right in the hot midday sun on Jumeirah Beach Ski Dubai advertises its indoor ski slope. Precisely because of these moments it is worth to travel to Dubai. Sunset in front of the most famous hotel in the world, the Burj Al Arab. 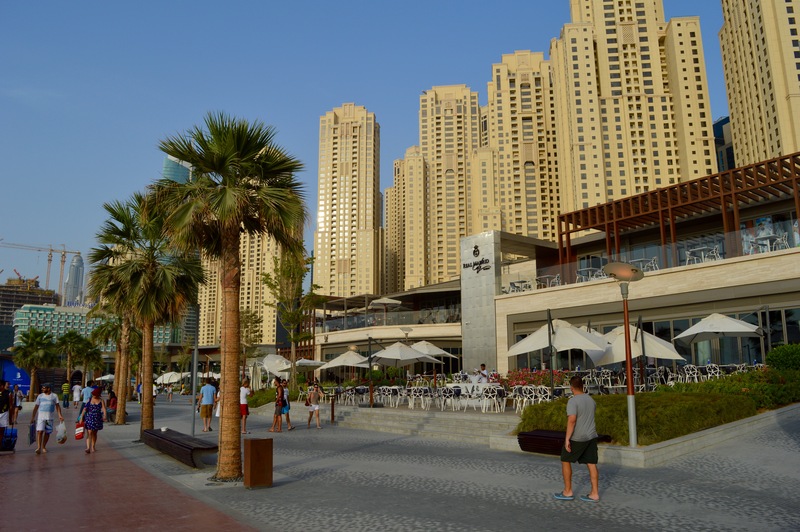 An other completely new part of the city is located further west – the Dubai Marina. This area holds an other world record, of course. More than 200 skyscrapers are built there since the start of construction in the year of 2003. The special feature, in addition to many restaurants and hotels, is the 4 kilometer, artificial scale canal, which meanders through the entire district. 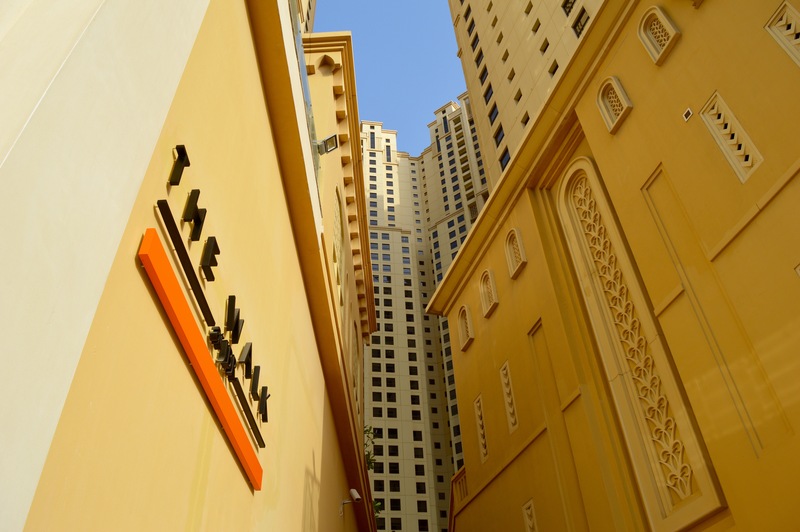 Its heart is the Marina Mall, where you can cool down while strolling through 130 shops. 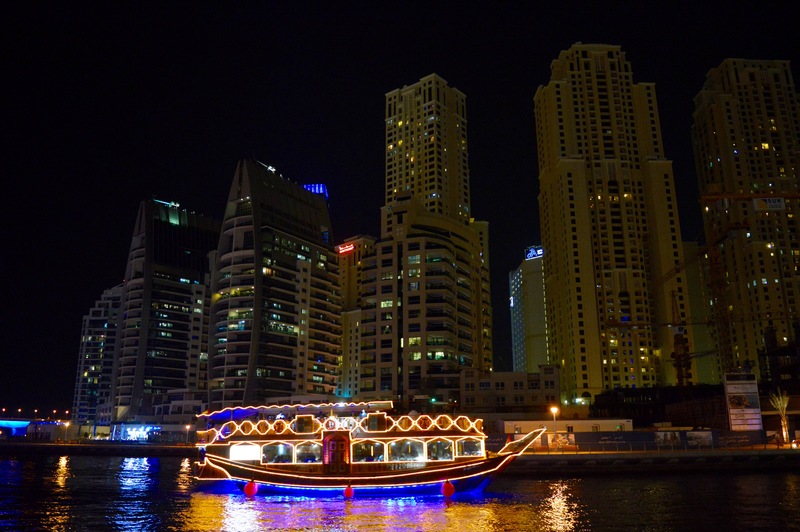 Because spending an evening at Dubai Marina is not highly recommended – incredibly warm and humid, the temperatures there are still high, even after the sunset! The high humidity, caused by the channel, and temperatures at around 35 degrees let you sweat as soon as you walk just a few meters..! 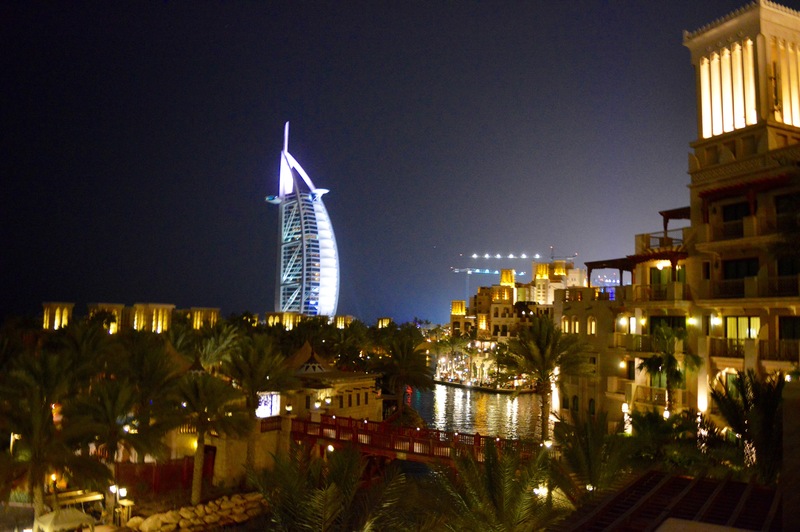 Another MUST was recommended by a local couple – The Madinat Jumeirah. A small lagoon city, built in the old Arabic style. It is penetrated by channels that can be sailed with small water taxis, called Abras. The real highlight in this community and hotel center is the Souk Madinat Jumeirah, especially if you visit it in the evening hours. Many small shops, restaurants and antique shops are lined up in the air-conditioned indoor area. Dubai and Gold – no other combination appears as inseparable as these. Gold is omnipresent in public buildings, especially in the Emirates Palace in Abu Dhabi. 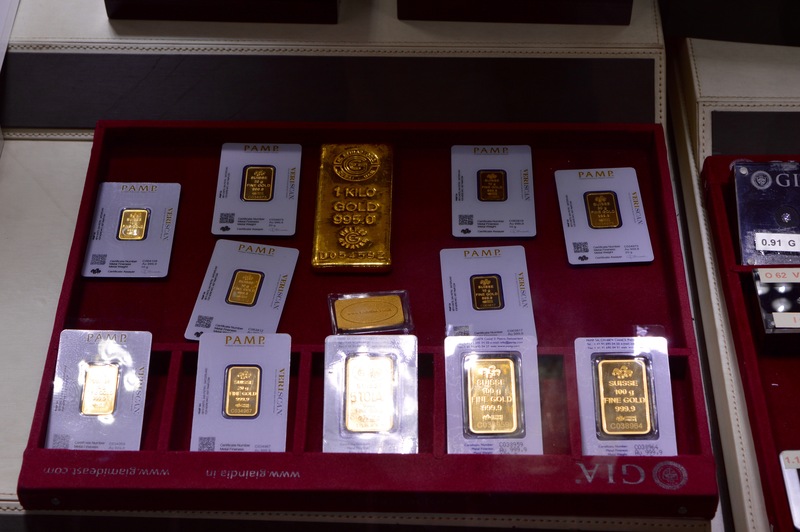 Because of that, it is not a big surprise that one of the largest markets for gold and diamonds is located in Dubai´s old town Deira. But „market“ is probably the wrong word to describe the souk. It´s more „real“ shops with store windows and alarm system. 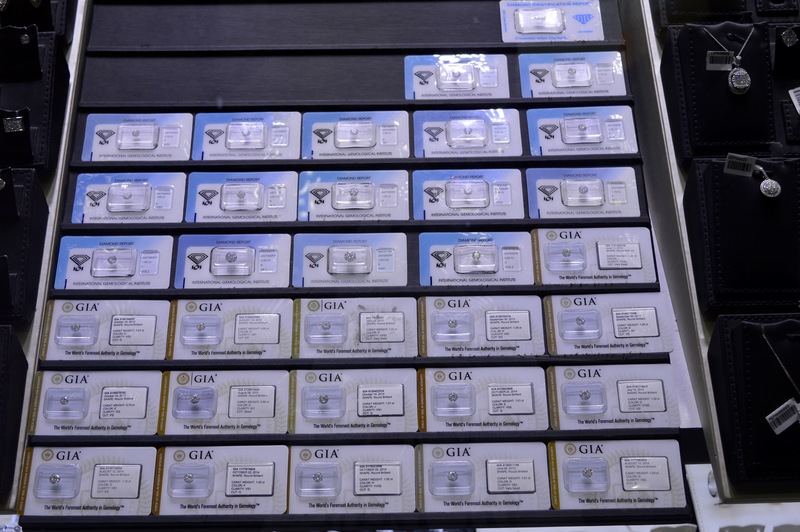 Many jewelers are strung together and offer the most unusual products in their shops. Interestingly, the price of all products is based solely on the weight – and the price therefore is published on several screens, updated daily. Nevertheless, you have to negotiate – so you can lower the price profusely. 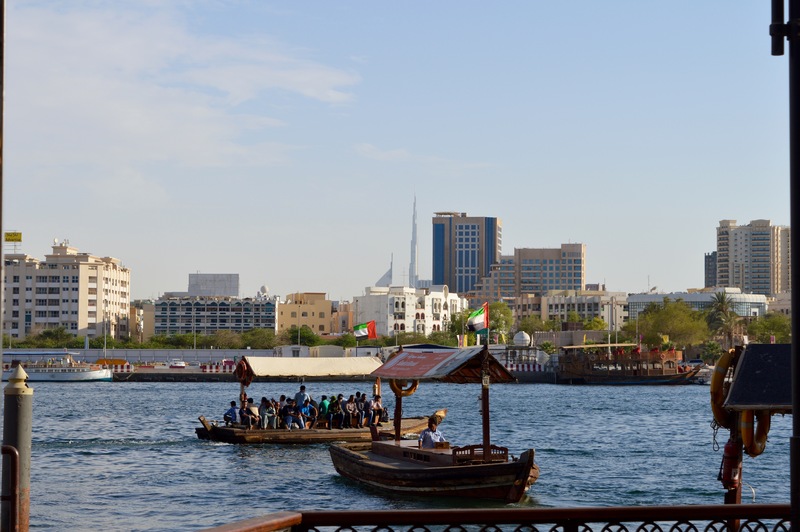 Around the corner of the souk, there is the Dubai Creek – a natural offshoot of the Arabian Gulf. You can cross to the other district Bur Dubai with old water taxis. 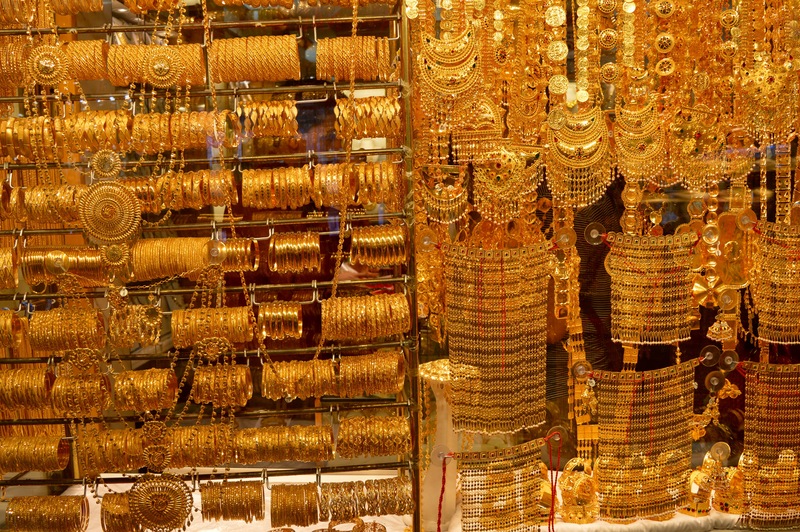 One more thing about gold – in the United Arab Emirates you can also buy gold at an ATM. As in the Souk Madinat Jumeirah, as in the Dubai Mall and the Emirates Palace in Abu Dhabi you can find these machines. However, what you definitely need is the experience of a sunset in the desert! The best way to make this possible is with a desert safari. This can already be booked in advance from home (as in my case). Picked up right outside the hotel, a four-wheeled Jeep paves the way over the dunes of the largest sand desert in the world. For this trip, however, requires not only a strong stomach, but also enough space on your camera. The moments that you experience on such a tour, are absolutely unforgettable! The tour stops in a desert camp. 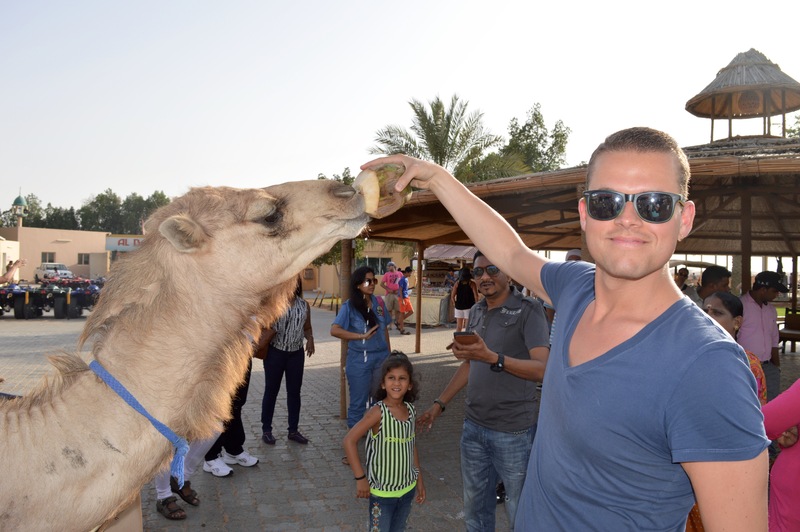 Here, among other things, it is possible to ride on camels, smoke shisha or wear the traditional Arab clothes. The highlight is a delicious barbecue that you can eat in front of a belly dancer, who shows her skills on a illuminated stage. In summary, Dubai definitely is a city of extremes. However, extremely beautiful! The same is true for Abu Dhabi and Ajman. Once in your life you have to experience, how it feels when you step out of the (too) well air-conditioned hotel lobby into the street and suddenly you almost can´t breath anymore. But you get used to the temperatures quiet soon. And from then, the joy begins – from the super delicious smells in the malls, the indescribable sunsets (especially in Ajman), the very friendly locals to the very impressive skyscrapers, which can be found everywhere in the city. Reason number 1 for me to visit the metropolis have been the world-famous attractions Burj Khalifa, Burj Al Arab and Mall of the Emirates. And not just for that, the trip was definitely worth it! 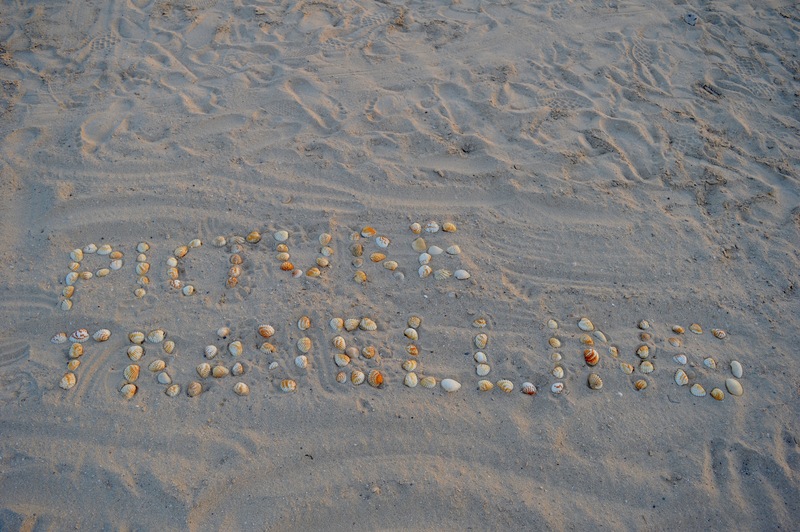 Where did you book your trip in the desert? the trip in the desert was booked through „Get your Guide“. It is called „Desert safari with a Landcruiser in the evening from Dubai or Sharjah“.